Tom Hayes is an artist, as well as former and future artist residency director. We first met Tom when he was running Da Wang Culture Highland in Shenzhen, then caught up with him again in Guangzhou during his residency at Kiwisual Arteco. He'll be switching gears again very soon to launch a new residency project outside of Zhanjiang this fall, all the while continuing to make his own work. China Residencies: When did Da Wang close? Tom Hayes: Da Wang closed officially in March, the owner decided to rent out the space commercially. CR: Where there any warning signs? TH: It had always been a possibly that the space could be rented out to the right person. I knew that it could happen. CR: What is happening to the space? TH: The exhibition space is now rented now by a club, and the studios will be put up for rent. Da Wang is part of a bigger real estate company founded by Zhang Yufang. He also personally collected a lot early contemporary Chinese art that he sells off sometimes. The broader company had financial issues, so there was no choice but to close the residency. CR: How much advance notice did you have? TH: Two months. One resident, Jeff Musser, stayed until March, and another, Liu Haitao, was planning to stay for longer, but I hadn’t fully confirmed any other artists past the new year, and had actually wanted to move more towards hosting groups of artists around a singular theme. We had also started doing these parties with The Real Deal, and getting the artists involved with their warehouse parties. The Real Deal weren’t making any money from it, they are just a group of Chinese and foreigners who did this on the side, and wanted to experience new music. It was free, and the drinks were really cheap. I first went to one of their parties a year and a half ago -- it started out proper rave style, with the location was announced an hour before. Then they kept doing them in different locations, like one of our old warehouses at Da Wang. They ran into some trouble with the police a few months ago, because they weren’t properly announcing their events to the relevant authorities, who are very concerned about large groups of people gathering. CR: How did you get to Da Wang in the first place? TH: I came to China for a ceramics residency at Dehua, a place that’s now closed but used to be located four hours from Xiamen. They didn’t have any staff that spoke English, which started me learning Chinese. Then I went on to do the six month Sanbao fellowship in Jingdezhen and had a solo show at the Pottery Workshop. I was thinking of just renting a studio in Jingdezhen, but a friend from Turkey named Eko Yazici who was living in Jingdezhen told me about this opportunity in Shenzhen. My friend was driving down to Hong Kong, so we both went to Wutong mountain to check it out. Then I travelled around India for five months before coming back to Da Wang for a six month residency in the summer of 2011, and when the previous director left, I took over the job of running the residency. I worked on getting the gallery in order, straightened out the accommodations and studios, and started advertising the residency on international platforms. Those initiative really paid off, and in the three years I was there, we hosted around 70 or 80 artists. CR: And what brought you to this residency at Kiwisual? TH: Emma [Kiwisual's residency director] came to one of our exhibition openings at Da Wang, then I brought Da Wang artists here to see if we could work together. I was getting ready to leave Da Wang and focus more on my own work, and I also needed to figure out how to get my dog, Labi, back to the UK. So when I found out that Da Wang was closing, it became a great opportunity to take a break and do a residency of my own - just too convenient. And the idea of the stone, this alien egg, fit quite well in the way I wanted to work. Kiwisual invites artists on short residencies to create a custom stone-shaped sculpture during their stay. 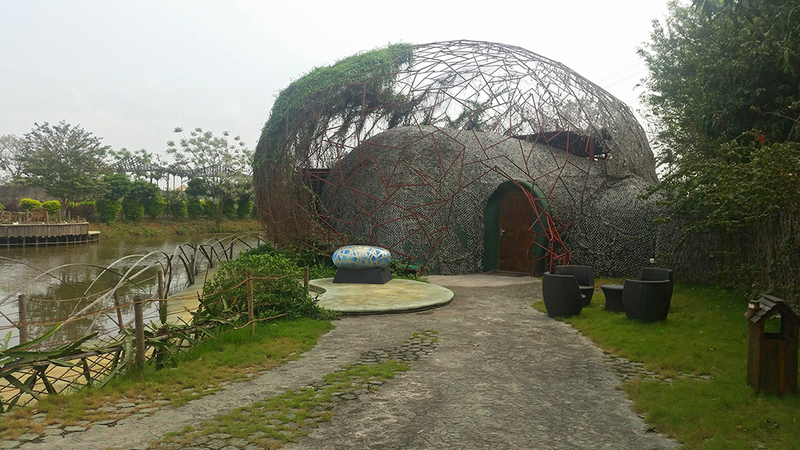 There's also a karaoke bar inside that big egg-shaped structure! CR: When did you get here? TH: Over a week ago. I submitted a proposal of my project for the stone, but since I come from a ceramics background, I proposed a slightly different concept than just painting on the stone. I needed a space where I could spray ink and that wasn’t too windy, so I turned one of the kitchen spaces into a studio of sorts, but otherwise there isn’t a proper studio space on site. CR: What do you think of the whole environment? TH: I prefer to be in spaces like these that are a bit more peaceful. It’s a bit outside the city. It’s a nice environment for Guangzhou, it’s a rare opportunity. It’s well serviced too, it’s a resort really. They clean the rooms, provide three meals a day, albeit currently quite basic. Yesterday a group of people came for a meeting, there was a big lunch. CR: How much do you interact with the team? TH: Steven [Kiwisual's art director] isn’t based here, but he wants to make a film about each artist, and really use the whole experience of artists being here as part of their company's portfolio. They create really nice publications, they’re really helpful but they’re not too demanding. They all want to know what I’ve been up to, it makes a big difference. CR: How are you working with the commercial aspect of this residency? TH: Well I’m trying to be a little ironic with it, using the pattern of “kou” the character for “mouth” to reference consumption in my work. For me, it’s a fascinating project to work with a plastic stone, since I usually work with real natural materials. I’m happy to produce something for this stone project, and they do really want to take them places and show them in different cities. If it sells, great, they’re very transparent about how the profits will be split, and otherwise this seems to just fit in with some of the work I've been doing recently and I'm enjoying being a full-time artist again, rather than doing all the running around, hair falling out, organising and managing. I’m glad they’re working on showing them in public spaces, to audiences who might never walk into a gallery. Artists like Frog King took the project to heart too, he really thought about how to transfer his work and performance onto this object. CR: It’s an interesting approach that doesn’t hide the fact that there needs to be some financial return. TH: Well there’s a slight naivety in how simple this is — we’re all learning, and they’re dedicated to figuring it out. The original idea was really just to create pretty rocks, like Cow Parade, the cow project that started in Chicago and New York City in 1999. Some of them were just cute and wacky, but it’s great to see people start to work a little more conceptually. CR: What are you doing with your stone? TH: It’s rooted in languages, I call this series I’ve been making in China “Origins” — for ceramics, it was thinking about its start in the earth. The very beginnings of civilzation and language is another fascinating aspect for me, from the origins of simple symbols to the new languages of computing and binary coding. I’ve been creating installations of clay and porcelain, using, often pictograph, characters that relate to the land and nature. I started with the idea of the seal as signature, and with the elemental geometric shapes of circles and squares. In traditional Chinese culture the square represents the earth and the circle the heavens, and seals are originally made form stones. The stamp becomes a signature of itself, not using a stamp to write my name but to represent the earth. I’ve been working with the four character chengyu structure, they’re often aphorisms that have a broader meaning. The number four also directly relates to the four corners of the earth, the sixiang four symbols unfolding from the Taiji, and the four sided square in this sense, I asked someone why it’s always four, and they said because two is lucky, so two twos is even luckier. I guess I'm trying to link that moment at the dawn of civilization with this moment now in history, the future, technology, computing, connections and communication. Also, my Chinese work permit says “alien", so I kind of like this idea of being an alien here. You really are an alien here. CR: The US also calls its non-citizens “aliens” and artists can sometimes get a visa for being an “extraordinary alien” like in that Sting song. TH: Oh I didn’t know that! And I drink both coffee and tea, my dear. CR: [laughs] Anyway, how is the work you’re making here related to or different from your usual practice? TH: Like a lot of my work this uses very earthly or monochromatic colors. This work is really stripped back to geometric shapes - I suppose as some reference to science and mathematics and the prescence of man. I like in islamic art how geometric patterns are a way to transmit understanding of science and nature on a different level, as it is forbidden to make representations of God. It kind of looks like minimalist art, to a foreigner’s eyes. There’s a rejection of personal expression, though you get close and you can see it was done by hand and not a machine. 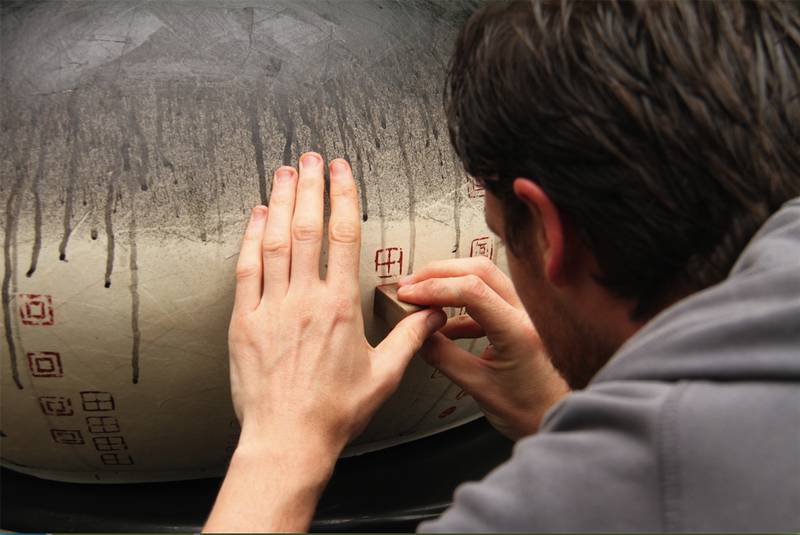 I’m hoping that for Chinese audiences, they’ll see “tian” the character for field, then see the rice, the soil, and make the connections that way, and from a Western point of view, they’ll see a square and the ink, and then make the link through the text. Traditionally, ink is made from burned pine resin. 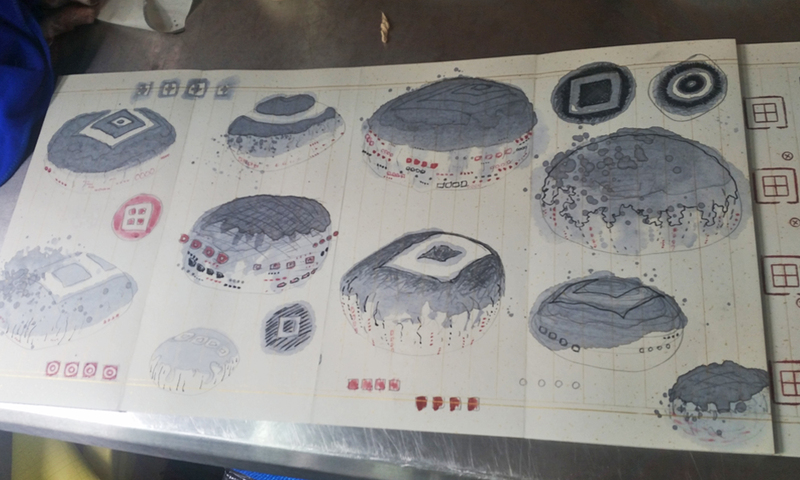 I worked with a friend from Dafen painting village called Huang Huaiyan to make the seals, and he’s so knowledgable about Chinese painting and symbolism. It's quite strange geometric stuff but he gets some expression in there too. He’s creating part of this. The seals he carves aren’t simply about me making a mark directly, it’s about creating a channel for marks to be made. Like when I layer seeds into pots that grow and change the shape of the object, burning away during the firing, leaving behind traces of forms and behaviours. Tom's ink and stamp sketches for his stone. CR: What else have you been working on? TH: I’ve been working with felt mats that are used to place under calligraphy paper, to absorb the excess water, looking into iterations of the Bagua as they fit into matrixes. The Bagua are 8 symbols derived from the Taiji understanding of the universe. The mats are used just a tool to get dirty with marks during the painting process and sit there under the paper unnoticed. The stamp is also usually a very small part of the final painting but I’m taking them as an essential, central part of the image. I also don’t feel that it’s maybe so respectful to dive in to Chinese ink painting, splash around a bit and then sit back and expect Chinese people to engage in a dialogue about the work. This is a traditional art form that has been around for thousands of years, one of the oldest we know of, and it can take people their whole lives to really feel they have an understanding and feeling of what they are doing. I could learn calligraphy for many years and I will still be no better than a child, and everybody would be so polite they would never tell me. As much as I love it this is not my culture or heritage; and the characters, poetry and context is often integral to these works. I'm interested in ways that we can consider materials and processes and communicate across borders, creating new contexts. The longer I’m here the more I learn and get inspired. I’ve been telling Emma as well, when it comes to residencies, the longer is better. A month is much too short for a ceramics residency. You need time to think about things. When I arrived in Dehua, there were these massive 400 meter long kilns, called dragon kilns — they’re built into hills on an incline, so the heat and the fire rises. They burn fires for weeks, and they were burned for the emperors. And if anything is imperfect, it was thrown away – owning imperfect versions was a serious crime. So the hills and rubbish bins are filled with ming dynasty cups, I used a lot of those discarded ones in my work. These massive kilns are early mass production centres, where a teapot it copied like a data file. CR: The scale of what’s possible here is really incredible. And after this residency in Guangzhou, where are you off to next? TH: I’m doing a residency in Japan in Arita, sort of the Jingdezhen of Japan, where I will be making some tea cups and coffee mugs, also as part of the same series of works. I’m working with a guy named Sebastiao Pimenta, who I met managing the studio in Sanbao, and now he’s managing the residency there after it was set up by an artist named Shin Koyama, who I also met in Sanbao 4 years ago. It’s totally different from here, but I’m going to be stamping the unfired ceramics, like what is traditionally done on the bottom of the pot, again as a signature. Also, going right back to the moment I first arrived in China I will at last develop the works I made in Dehua using cooked rice within the actual plaster moulds. I didn't leave China after that first initial planned nine months because I didn't feel like work was resolved. I was looking for something fresh, that wasn’t so familiar and easy as Europe, where I come from. Many things now have become so integral to my work. Looking back I have always been interested in what fragments of “eastern” philosophy made it to the UK. I come from an officially Christian country and I am an athiest, though ideas relating to Buddhism and the taoteching and even Zen I’ve already really been able to look into much more deeply since being here. It's listening and asking people questions and just watching people, I guess that too makes such a difference. CR: You’re also helping set up another possible residency program in Zhanjiang, can you talk a bit more about that project? TH: There’s a new residency project starting in Zhanjiang, a coastal city right across the straight from Hainan. It’s a tiny city by Chinese standards, with only 2 million people, though not crowded. It’s beautiful, and the government is trying to push it as a holiday destination, so it has some lovely beaches. It’s also a former French colony and still has a section of the city with original European architecture. It’s only about a hundred years old, but now it’s this developing modern city that has had a lot of money pumped into it so it's very clean and organised and new. It’s very green too, with lots of parks. The French took over in 1899, signing a one hundred year lease and at the time, France also had Vietnam, so the class hierarchy they set up put the French at the top, then the Vientamese, then the Chinese as workers in the lowest position. China took the city back after World War 2, so it’s got this really bizarre history. One of Zhanjiang’s first industry was brickmaking, so outside the city is an area with lots of massive brick kilns that shut down in the 80s and are totally ruined now. This lovely entrepreneuring local lady named Juan Jie started firing charcoal in one of the old brick kilns and selling for export. Since firing charcoal emits steam instead of smoke she was permitted to do this by the local council. The steam is redirected into several other rooms build on the sides of the kiln where people can and use as saunas. They put different herbs into the water and they offer different therapies and baths for different ailments like joints, breathing, circulation. With the byproduct of the kiln she has created a health centre, a place for healing and Chinese medicine, and become quite famous in the local area. There is a large modern well-serviced hotel onsite.She sells the charcoal locally, for barbecues, water filters etc, and it has been made into products for different things from shampoo to mattresses. This interview was conducted in Guangzhou on April 6 2016 by Kira Simon-Kennedy for China Residencies.